These little beauties are ridiculously tasty, so much so that you might forget they actually include some pretty nutritious ingredients. I was inspired to make them when I spotted some perfectly ripe plums from Warners Farm in my Farmers’ Feast challenge basket from the Ottawa Farmers’ Market. While the plums are a fantastic choice, I am confident the bars would be equally delicious made with any fruit, especially ones with a bit of tartness to them. I made a batch with a vegan margarine and that was also very successful. I plan to try them with raspberries next. They’re so quick and easy to prepare, I know I’ll be making these often as they were a huge hit with my family. 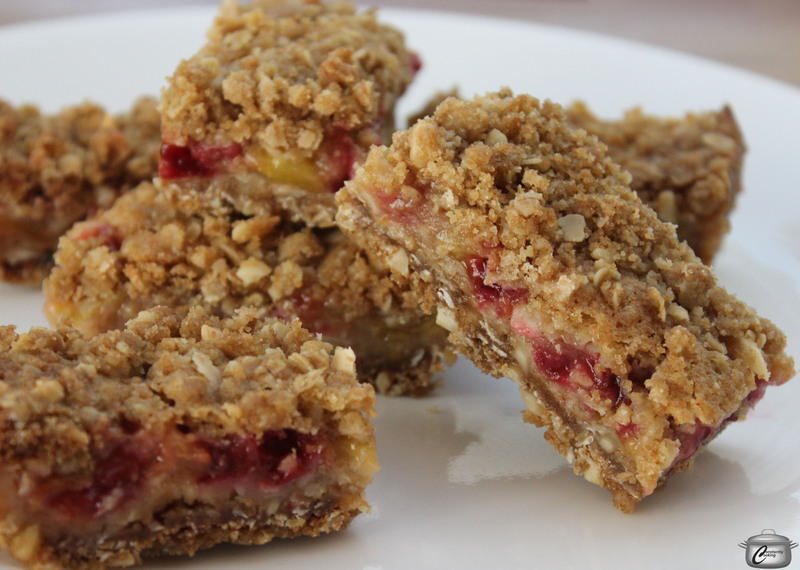 Oats, almonds and fresh fruit make these delicious breakfast bars a healthy morning treat! Line an 8 x 8 inch (20 x 20 cm) baking pan with parchment paper and set aside. Prepare crust by combining ingredients in the order listed above, blending together until evenly crumbly. Divide crust mixture in half; pour one half into the prepared baking pan. With your fingers or a spatula, spread to form an even layer, pressing down firmly. Bake bottom crust for 12 minutes. While crust is baking, combine fruit filling ingredients in the order given and stir to blend well. Set aside. After bottom crust has baked, pour fruit mixture over top, using a spoon to distribute evenly. Sprinkle remaining crumble over top of fruit (it’s easiest to do this by hand, rather than with a spoon). Return the pan to the oven and bake 30 – 35 minutes more, until golden brown on top. Let cool on a wire rack for 10 minutes, then lift the bars out using the parchment paper as handles. Let cool completely on a wire rack (speed this up by putting the bars and wire rack into the fridge), then cut into 18 bars. Store in an airtight container at room temperature for up to 3 days or freeze for longer storage. This entry was posted in Baking, Breakfast, Farmers' Feast, Fruit, Ottawa Farmers' Market and tagged almonds, baking, bars, breakfast, breakfast on the go, breakfast on the run, butter, cinnamon, Farmers Feast, fruit, grab and go, healthy, make-ahead, morning, Niagara, oatmeal, oats, Ottawa Farmers' Market, plums, raspberries, squares, sugar, vegan. Bookmark the permalink.